Ever feel like you get into a creative rut? or an unproductive rut? Well to help me out of mine and to keep growing my current skill set, I have set 3 creative goals for March. 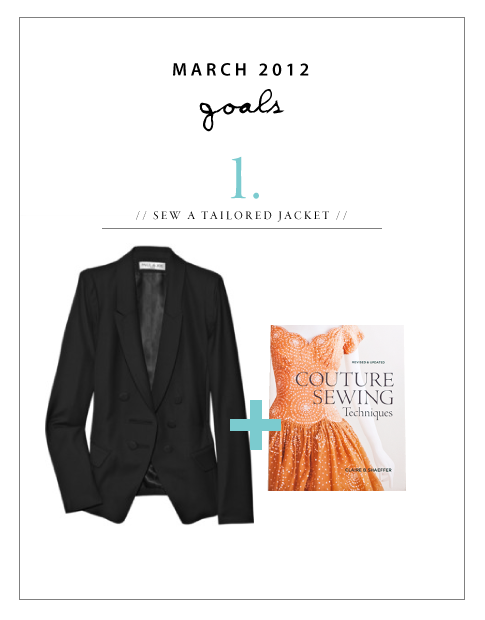 I want to brush up on my tailoring skills with the help of Clare Shaeffer’s ‘Couture Sewing Techniques’, and sew a hand tailored, (well it might actually include fusible tailoring) fully lined blazer. Due to time I will most likely choose an existing pattern. This gorgeous jacket is by Paul and Joe, a few seasons ago. I love that its double breasted, has quite fine lapels and that it is long line. So hoping to find a similar pattern. Textile design is something that I have been wanting to do for what seems like forever. March seems like a good time to start. Currently I have been inspired by Australian designer ‘Gorman’ and I think I might aim to design a square silk scarf, maybe geometric like this Gorman one. 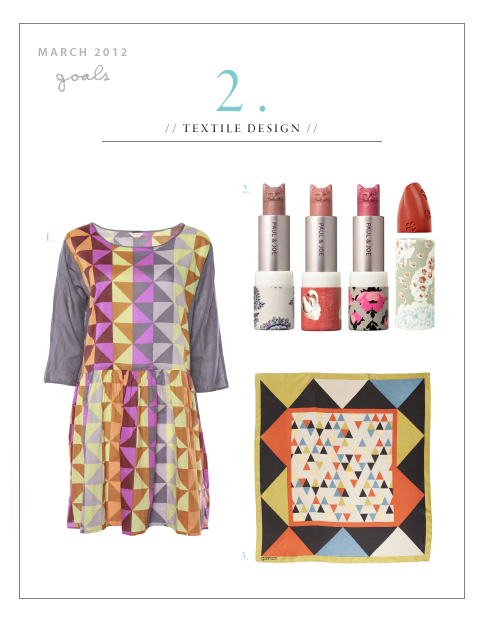 I am also always inspired by Paul and Joe’s graphic prints that they use for both apparel and beauty packaging. I love their use of cute animals, colour and pattern. While its not really a creative stretching goal, it is a goal and a creative one! Lately I have been a little concerned with the air quality around our home, especially since I spend around 8 hours + on a computer and I am surrounded with wireless technology which I although I am a fan, not 100% sure of what it may be doing to me! One solution to help make a more healthy indoor environment is to include plants! 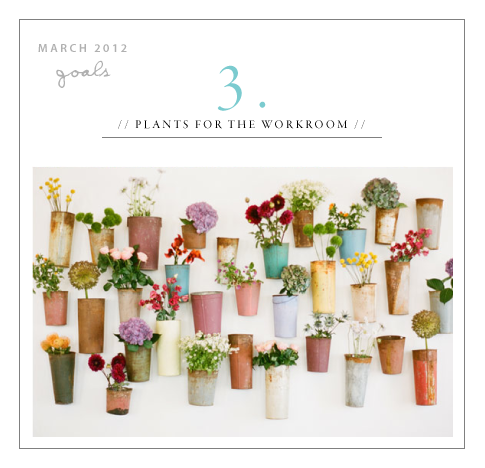 I love this wall display designed by Hatch Creative, the vintage vessels and mismatch of flowers and would love to try a small plant collection in our workroom and consciously breathe a little easier. So those are my goals for the next 3 weeks. I so hope I can achieve them and that I haven’t been too ambitious. Feeling a little nervous already, but excited to start.